#GRE – that is, Generic Route Encapsulation – gives us a way to encapsulate IP packets inside another IP packet. Why? Often times, the reason is to create an Internet VPN, forwarding encrypted IP packets inside IP packets that can be routed through the Internet. 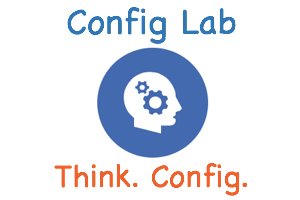 This latest config lab gives you a chance to practice the GRE tunnel configuration part of the task, while ignoring the encryption configuration. CCNA 200-125 Cert Library – a Box with ICND1 100-105 and ICND2 200-105 Cert Guides. No More, no Less. This design for this lab shows two sites in a company, with a WAN link that runs through in the Internet between the two sites. Note that the WAN link represents what would normally be the Internet. That single link uses subnet 192.0.2.0/30. The enterprise uses private class C networks that begin with 192 in the internal networks in the enterprise and on the tunnel itself. Reference the interfaces as the tunnel source. You choose the tunnel destination addresses. Use private class C network 192.168.3.0/24 on the tunnel for the private addresses inside the enterprise. Assume all device interfaces shown in the lab are up, working and with correct IP addresses assigned. Example 1, 2, 3 and 4 show the beginning configuration state of Edge1, Edge2, Acme1 and Acme2. Next, write your answer on paper. Or if you have some real gear, or other tools, configure the lab with those tools. You can verify the configuration and operation of the tunnel interface in several ways. First, from the edge routers, issue a show interfaces tunnel0 command. 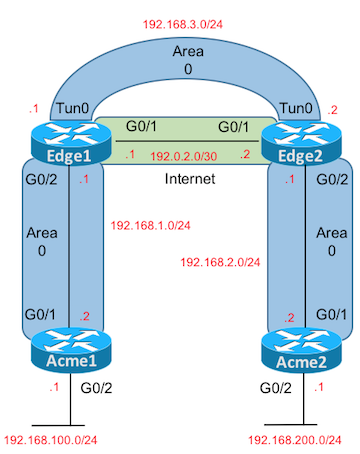 From those same routers, check if Edge1 and Edge2 become OSPF neighbors; if all parts of the lab are configured correctly, the two should become neighbors. You can also test with pings. First, from the edge routers, just ping the private IP addresses (192.168.3.1 and 192.168.3.2) on the other end of the tunnel. Also, connect to the other two routers, and use an extended ping to test from Acme1’s G0/2 interface to Acme2’s G0/2 interface. For instance, from Acme1, issue ping 192.168.200.1 source 192.168.100.1. The virl topology matches this lab topology exactly. Hi, so that it can work I have added the static ip routes on all routers, Acme1 and Acme2 as well, cause only with this configuration the two PCs can ping each other. Right? If you want to use static routes, that’s ok with me. However, the intent with those bullets that mention OSPF (about midway through the bullet list of requirements) is that you enable OSPF on the tunnel interface. OSPF is already enabled on the private LAN interfaces on all four routers, so that once working over the tunnel, all four routers should be able to learn routes for subnets in the various 192.168.x private networks used in the example. Good exercise though – get it working with static routes (since you’ve already started), then remove them and try it with OSPF.